The two men come from different worlds yet discover they have more in common than they thought. Yet will their relationship last when they’re apart for months on end? Publisher's Note: This book is linked to the Home series by T.A. Chase. T.A. Chase is a new-to-me author. I need to stress that you heed the publishers note in the blurb, about how this series is linked to the Home series by this author. Not realizing, I chose to review and was excited because this was listed as book #1. While this is the first in a new series, how it was linked to another, I felt as if I had been dropped in the middle of a series, right in the middle of a book, on page one. For me (and I've read many series which are a part of another, but only this one and another was difficult to read because of this), it felt more like a continuation of the other series, which clearly I have not read, than one that is connected by characters. What I'm trying to say, it should have had a designation as being another in the Home series. 20+ characters were name-dropped in the first chapter alone, with parts of their histories brought up, when I, the reader, was simply trying to get a handle on who was narrating this story to me. This was a very difficult start, in a story which was very simplistic. Truly, read the other series first. While the story itself flowed easily, moving from Edward's narration to Hunter's, and back again, and the premise was simple enough to get a handle on as long as you rolled with the flow and didn't try to figure out who was who and what had happened in the past. The connection a reader develops with the cast of characters wasn't there, because it was written with the knowledge of many books prior, so I missed what is usually present in the first of a series – the character building, which was in books past. My experience was lessened due to this factor. I rated three stars simply because even after reading the book in its entirely, I felt short-changed, which makes rating and reviewing difficult for me. Because no doubt if I was connected with the author and the characters via the other series, my reading enjoyment would have been exponentially higher. This is my fault, so do yourself a favor and heed the note in the blurb, unless you're like me and only went by how this was the first in a series and don't read blurb, as some now hold too much of the story itself – also, my bad. Once I ignored how I was confused, and concentrated on Edward and Hunter, I read the book fairly quickly in a matter of a few hours. Sweet, filled with warm and cuddly romance, which is sure to please those who are looking for more romance than story – heart-warming. Will I read more by this author? Only if I go back and begin the Home series from the start. Until then, no I don't feel the need to read book two in this off-shoot, as I felt, confusion and the disconnect aside, that the narrative and dialogue was too wooden for my tastes. 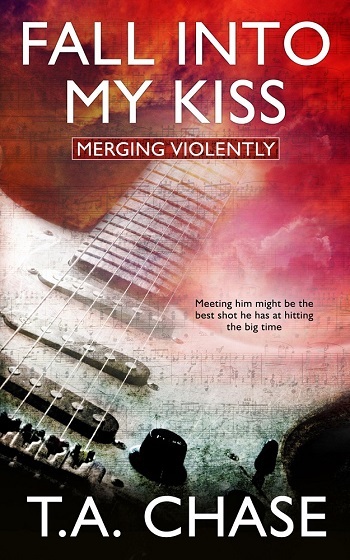 Reviewers on the Wicked Reads Review Team were provided a free copy of Fall into My Kiss (Merging Violently #1) by T.A. Chase to read and review.